PCPL Wireless Division was established in 2012; we are an Indian high tech RTLS Product and Solutions company; we partner and create products and solutions for your needs with world's top indoor & outdoor precision positioning chip manufacturers. We provide wireless precision positioning solutions using the UWB, Wi-Fi, BLE, RFID, GPS and other technologies. Our products and solutions provide Real Time Precision Locations for tracking any object in 2D or 3D space for both indoor and outdoor applications, positioning accuracy of meters to centimeters level can be attained depending on your security needs, required data Intelligence and applications. These products and services can be utilized for wide range of applications, precise positioning helps to control efficiency and personnel safety management. The Real-time Location System are currently used across Factories, Industries, Smart Power Plant, Smart Chemical, Forklift Crash Prevention, Robot/UAV, Underground Space, Smart Sports, Smart Retail, Warehouses, Special Training, Automotives and many more sectors where intelligence of captured data can be capitalized for higher control, accountability and smart productivity. The Real-time Location system having centimeter-level positioning, the system capacity and wide coverage and strong anti-interference advantages. The use of advanced personnel positioning system can effectively enhance the on-site construction workers and technical personnel safety management. Real-time positioning on-site staff, intuitively reflect the factory operations and personnel conditions, improve staff security efforts and efficiency, personnel safety monitoring and management of powerful tools. RTLS in FACTORY provide online and offline applications to enhance your manufacturing process. It provides support to day-to-day employees by providing real-time manufacturing intelligence and control, identifying opportunities to increase efficiency and improve profitability. The mobility of forklift trucks may pose a safety hazard. How to improve the production efficiency through the analysis of forklift operation data is also a key concern of the factory or warehouse. Provide precise positioning data for the storage intelligent management platform. Improve the efficiency of forklift management scheduling. With accurate location information, businesses can make considerable improvements in cost, service, and profitability. UWB RTLS to provide enterprise employees with a broad range of solutions for locating, tracking and managing assets and inventory, employees and visitors. The organisation can locate customers by real-time location, understand the individual needs of customers, retail data analysis to provide support. Shopping cart movement tracking within the premises can be done to analyze and improve the quality of human services in the outlets and the scientific level of business. Smarter sports, through real-time positioning of players and football position, real-time understanding of the status of athletes and collecting game data, evaluate the effectiveness of the game, which will benefit the team's one-stop management. A large number of exhibition hall staff, more messy, not conducive to safety management and data statistical analysis. RTLS in Exhibition Hall, which is conducive to push precise information about booths at fixed points, make use of positioning data for statistics, understand visitors and facilitate data management of exhibition halls. 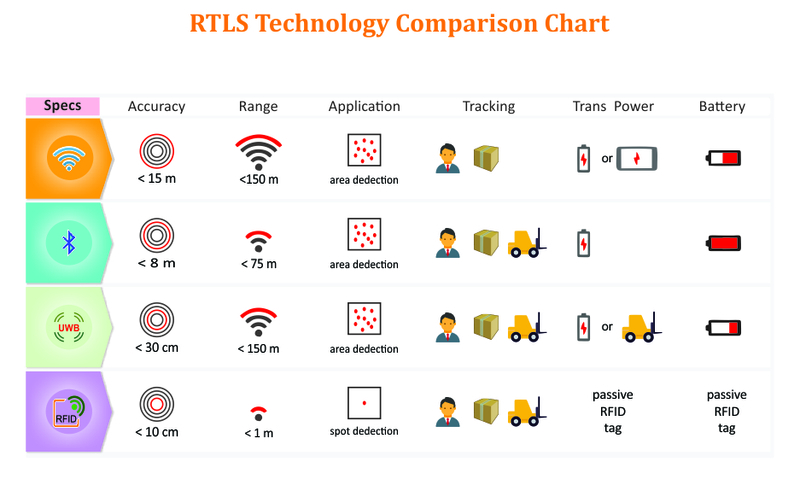 The RTLS in robot is UWB-based high-precision robot positioning products, accuracy up to 5cm, only the deployment of four anchors, the robot installed on the tag, you can achieve precise positioning and self-walking effect. Connect for more details ! !